A costly fire broke out in a luxury sports car in the city’s downtown core late Friday. 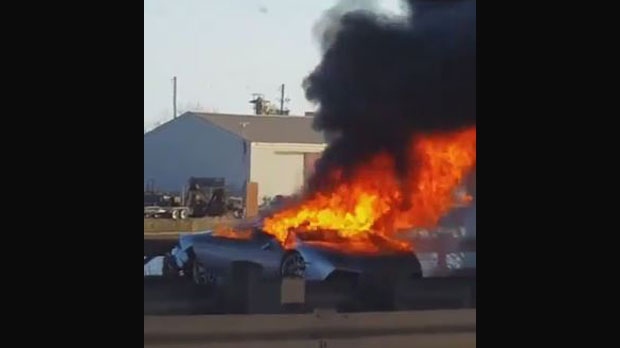 A Lamborghini was “completely burned out” on eastbound Lake Shore Boulevard around 7 p.m. after police believe the vehicle hit the guardrail before becoming engulfed in flames. No one was injured in the crash, and all the car’s occupants escaped before the fire broke out, Const. Jenniferjit Sidju, a spokesperson for Toronto police said. It’s too early to know if any charges will be laid, she said. There is no word yet on the driver's age or gender. A flatbed tow-truck is needed to clear the wreckage, according to investigators. Police have closed eastbound Lakeshore Boulevard at Cherry Street to investigate the crash. The roadway is expected to open at 10 p.m.